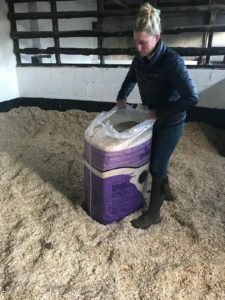 No matter which of one our bedding you choose to use, all are designed to provide you with a premium and highly performing bedding, but don’t take our word for it, here’s Jess Errington from Harry Meade Eventing. For a totally new bed, our customers seem to suggest that 2 bales are sufficient for a 12ft x 12ft stable or loose box, where the bedding covers approximately half the floor with banking. Just like wood shavings, remove droppings and scoop out any wet bedding at the base of your bed. If possible, its a good idea to brush the bedding back to let your floor or matting dry but this isn’t essential. Put your horse bedding back in place, building banks to avoid casting, just like you would for shavings. Caviera horse bedding can be used as a light covering over matting or a deep bed, whatever your horse prefers. Top up your bedding as and when required, obviously this will vary, but 1 bale a week seems to be about the average. 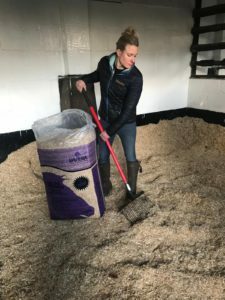 Our entire horse bedding range can be added to your muck heap as usual and you’ll find that it rots far quicker than wood based bedding, meaning you’ll benefit from a smaller muck heap and reduced costs.